When you use Outlook 2007 and later in Cached Exchange Mode, the Instant Search feature uses the content indexes created by Windows Search (formerly known as Windows Desktop Search). When searching in online mode, Outlook uses the content indexes created by Exchange Search on the Exchange server (Exchange 2007 and later). If the index created by Windows Search is corrupt, you may not find the items you’re looking for and expect to be returned by Instant Search. Since you’re not using Exchange Search, there’s little point in troubleshooting Exchange Search on the server. 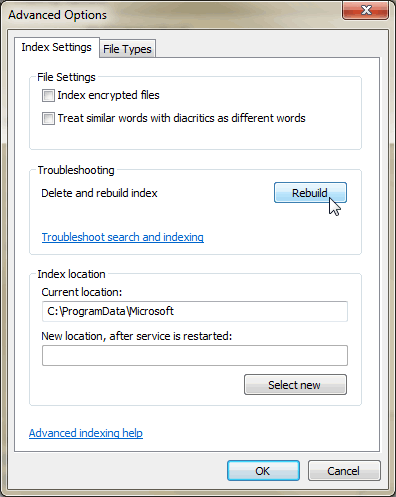 You may need to rebuild the content index created by Windows Search on your computer. Click the start button and type Index, and then click the Indexing Options link returned by the search. In Indexing Options, click Advanced. You are greeted with a prompt informing you that rebuilding the index may take a long time to complete, and some views and search results might be incomplete unitl rebuilding is finished. Click OK if you want to proceed. Its a good post with images and fluid guidance. It will be very useful for all. Thanks for the post.